Bookride: Is there anyone here who knows anything about books? Is there anyone here who knows anything about books? The above is from Helen E. Hopkinson's 'The Ladies God Bless 'Em!' (Dutton NY 1950) value probably less than twenty bucks. H.E.H. was a wonderful New Yorker cartoonist portraying privileged female life on The East Coast. The UK equivalent is probably Pont or Anton (although Anton has a crueller streak.) 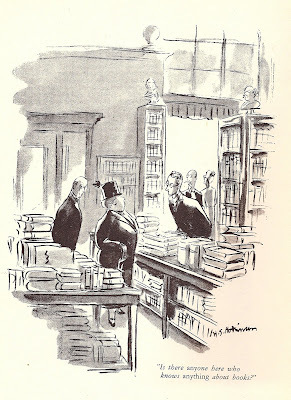 Many of Ms Hopkinson's cartoons involve a large lady, often in furs, asking infuriating question in shops (mostly about wine, hats, shoes or books.) At the box office of a theatre she earnestly inquires 'Just how funny is Milton Berle?' Like New Yorker cartoons today they raise a smile rather than a belly laugh. A glimpse into a vanished world. This book calls to mind a much later book, "This Literary Life," by Peter Van Straaten. At least as far as the cartoons. Hate to be the spelling police, but surely you mean HOKINSON not HOPKINSON?